Recently I presented a tasting of wines made from unusual grapes and our first wine was a lovely dry and aromatic white wine. I enjoy aromatic wines, but find that many of them can be a little too rich and low in freshness and acidity – think Viognier and Gewürztraminer. Of course in the case of Gewürztraminer the wines can often be sweeter than you want as well. They were a skilled and enthusiastic bunch of tasters and they all loved this first wine. Two things made it very exciting, firstly it is extremely good value for money, but more importantly it is really delicious and well balanced. It is from Hungary, it’s made from a very unusual grape variety and is made by someone that I admire very much. In fact it is so good and so pleasurable to drink that I have made it my Wine of the Week. 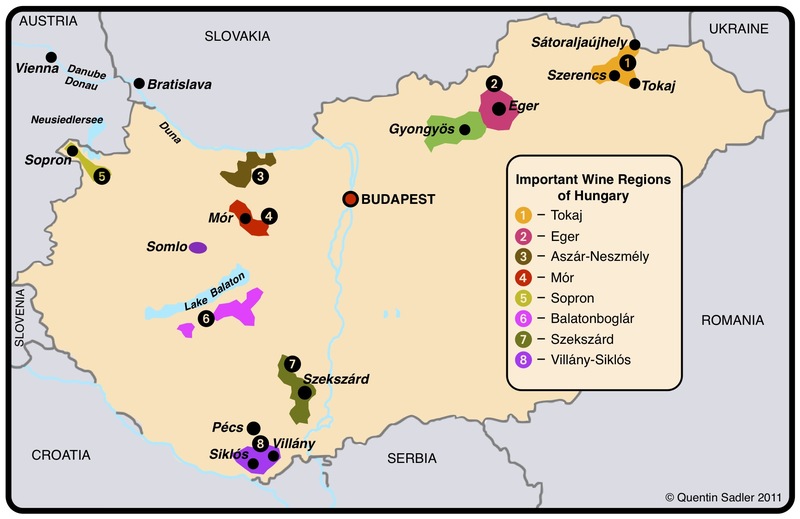 Wine map of Hungary – click for a larger view – non watermarked PDF versions are available by agreement. The view from Hilltop towards the Danube and Slovakia. Photo courtesy of Hilltop Neszmély. 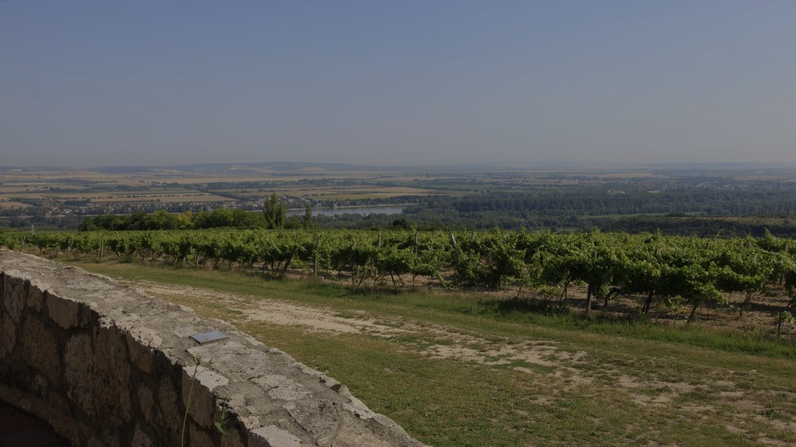 I have visited a good many of Hungary’s wine regions, including a memorable trip the the lovely Hilltop Neszmély winery. It is in the far north of the country with just the Danube River between it and Slovakia. The local climate is continental and very similar to nearby Austria and the wines have much in common with Austrian wines too, both in weight and style. The estate was the brainchild of the charming Éva Keresztury who has run Hilltop since the early 1990s and her success has been amazing. Her wines are available in many places and are always an incredible balance of quality and value, as far as I can see she has never put a foot wrong and makes some of the best good value wines available in the UK today. They also have a lovely hotel on the estate and excellent restaurant that specialises in local game. Cserszegi Fűszeres is certainly an unusual grape, but please don’t let that put you off. It is also very difficult, if not almost impossible to pronounce – but then I also showed Dr Frank’s Rkatsiteli from New York’s Finger Lakes at the same tasting. That is also quite superb and very hard to pronounce, but well worth trying – but don’t let that put you off. I am sure that you will enjoy it. The grape is actually a cross between the Irsai Olivér (itself an aromatic cross of 2 other grapes) and Roter Traminer ( a near relative of Gewürztraminer) and has only been in existence since 1960. The grape is named for where it’s from, Cserszegtomaj near Keszthely on the north shore of the south west end of Lake Balaton – Hungary’s inland freshwater sea. Fűszeres means spicy. The nose is delightfully aromatic with wafts of orange blossom, fresh grapes and some sweet spice notes, but it smells fresh and not cloying at all. The palate is soft with lovely weight of fruit sweetness, but is is a dry wine – just very fruity – with some nectarine-like succulence, zingy orange, richer peach and some apricot characters too. The orange dominates the finish, which is pretty and long. The wine is kept balanced by the lovely seam of refreshing acidity that runs through it making it lively, fresh and clean – 88/100 points. Available in the UK from Asda for £7.00 per bottle. What’s more it is only £5 a bottle during July 2015! This wine is a perfect summer drink, light, fresh, flavoursome and very, very drinkable. It would make an excellent aperitif, garden sipper or go with pretty much any food at all. It is especially good with lightly spicy food. Do try it if you get the chance – I am sure that you will like it.